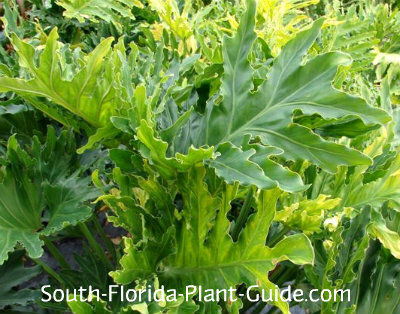 The easy-care Hope philodendron is a split leaf philodendron variety that only grows to 4 feet - an ideal tropical accent for any size South Florida yard. This is one plant that needs no fussing over. Thriving in sun or shade, Hope is a versatile garden addition that can set off ho-hum landscaping with the lush look of the tropics. Not too big, not too small, this plant doesn't climb like some philodendron varieties. These plants are classic armchair gardener favorites - a little food and water, cutting off a spent leaf stem now and then...and you're done. Hope is a moderate grower for sun or shade, though it's happiest in areas of part sun to part shade. It can get about 4 feet tall by 4 feet wide. This plant does best in Zone 10. In Zone 9B you can keep it in a container and bring it indoors during cold weather. Philodendrons contain toxins - handling leaves and stems can cause skin irritations in some people, so if you're sensitive to these things, wear gloves. These are considered deer-resistant plants, and bugs don't like them either. Add top soil or organic peat humus, mixed together with composted cow manure, to the hole when you plant. Choose a well-drained area that doesn't stay overly wet or any philodendron will rot from too much moisture. Water regularly but allow enough time for the plant to dry out a bit between waterings. The only need for trimming a Hope philodendron is to remove a dead leaf or stem occasionally. This is not a plant that should be cut back for size. Doing this is pretty much futile because of the way a philodendron grows (and doing so will spoil its good looks) so planning for ultimate size is important. Fertilize 3 times a year - once each in spring, summer and fall - with a good quality granular fertilizer. Plant 3 or 4 feet apart. Come out from the house 3 feet. If you're planting near a walk or drive, come in at least 3 feet (more if you can) to give the plant room to grow wide without getting in the way. Allow enough room between Hope and the plants near it...the large leaves may overlap other, smaller plants once the philodendron has begun to mature. This is a very good plant for large containers - great for balconies, patios, even indoors. COMPANION PLANT SUGGESTIONS: Orange bird of paradise, areca palm, firespike, heliconia, false aralia, variegated arboricola, croton, chenille plant, and pentas.